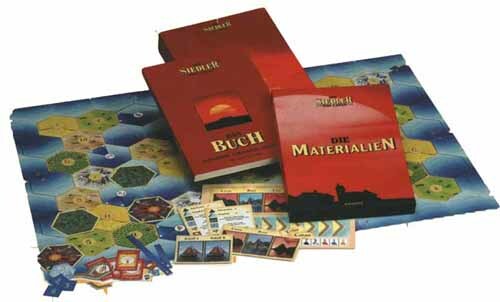 Game designer Klaus Teuber and German manufacturer Kosmos Verlag held a design competition for the Settlers of Catan product line. This special boxed set collects the top 15 new scenarios and 19 rules variants, plus 450 new pieces for use with The Settlers of Catan and The Seafarers of Catan board games. In this special sourcebook you will find new ways to expand your play of The Settlers of Catan. Klaus Teuber and Kosmos Verlag in Germany held a design competition, and the best results were included in this book. This competition attracted a wide variety of responses, so it is no surprise that an entire spectrum of new ways to play were included. Here you will find a 192 page book, featuring 15 new scenarios for the basic Settlers of Catan and the Seafarers of Catan expansion. You will also find 19 new variations on the game that will create entirely new experiences with the game. You will also find tips and tricks for improving your game, a discussion of the history of the game, and even some suggestions and tactics for the Settlers of Catan Card Game. Contained in this set is a box full of new playing pieces that will enable you to play these scenarios. Ten sheets of high-quality (die-cut) card-board counters and tiles that you can use in a variety of ways to enhance your Settlers of Catan experience. Featuring more than 450 new pieces for use with your Settlers of Catan and Seafarers of Catan games. Also included are 12 plastic bags and labels to help you organize you new pieces, and 24 plastic stands. We at Mayfair are proud that we are able to present this product to you. Though the book is in German, all of the scenarios and the special components are fully compatible with our version of the game. To assist you in enjoying the book, we have attached this translation of all 15 scenarios and 19 variations, as well as the special â€œSmall Tournamentâ€� rules for the Card Game. It is our hope that you will find that these scenarios and variants provide a rich variety of ways to enjoy one of our favorite games. Please note that this is NOT a literal translation, and some changes have been made to enhance readability. For fans of the Settlers of Catan, this book is a fantastic resource. It includes pictures of the prototypes, a history of the development of the game, and lengthy discussions on strategy, deck building in the two-player card game, and more great stuff. These sections of Das Buch are not reproduced in this translation. The editor would like to thank all of our legions of Settlers fans, without whom these translations, and all the success of the Settlers of Catan community would not be possible. NOTE: To play these scenarios, you will need to use at least a basic Settlers of Catan set and possibly some of the expansions.